It’s been a little while, and it’s been a little while for a reason. It is, as it turns out, tricky to cook, and write, and take pictures, and work, and go outside, and be very, very sad, all at the same time. Something had to give, and it was the writing, just for a little while. But it came back, as it always does, and it came back with this risotto, which is sort of Nigel Slater, and sort of me, and sings absolute unfathomable comfort in every grain of soft and oozy rice. I found it in a book at my grandparents’ house, near the Peak District, and I folded myself up on their sofa and thought about making it, back in London. We came home, and I was stirring the risotto, meditatively, and there was music from another flat, and someone across the road was setting off fireworks from their flat, and it seemed though they were just for us. Then we ate it under blankets, and for pudding we had big mugs of mulled wine, and clementines, and Celebrations, and mince pies we brought back with us from the North, wrapped in kitchen roll, parcel-taped to keep them safe. I must thank the lovely Lily Potkin for the loan of her knife, chopping board and beautiful flat, for these pictures. Serves 2 greedy people, and 4 restrained. We ate it all. 10 minutes prep., approx 40 minutes cooking. Butter, ~50g. I used the last bit I could find, shaving off any dangerously fridgy edges, and had to top it up with a glug of olive oil. Garlic. Four big cloves was exactly right. For once, absolutely no more. White wine, ~300 ml, or a good big glass. Salt, black pepper, a little lemon juice. It seems ridiculous to write out a recipe for risotto, especially one as simple and lovely as this. It is the easiest thing in the world. Chop the garlic finely; wash and slice the leeks into neat little green and white rings. Strip the thyme leaves from the stems (I ask you to agree with me here that thyme is the best smell in the whole world). Take a frying pan, and put it over a medium heat. Add the butter, and watch it soften. Add the leeks, and the garlic, and the thyme, and turn the heat down. Nigel Slater says that you shouldn’t hurry them, and he (as ever) is right. You don’t want them to colour, really, but you want them to soften slowly, drinking in all the garlic and the thyme and the butter. If the heat is low enough, they will be fine for twenty minutes, if you glug them with olive oil after a while. Watch them, but not like a hawk. They’ll be fine. Put the kettle on, and make up the stock. I will plug again my beloved Knorr stock pots, in the hope that one day they will give me free ones: they are insanely good stock, and fundamentally a different thing to the stuff you get from the horrid crumbling squares of dry paste. They are also not boundlessly more expensive, esp. on a deal. Which is nice. You will need about 600 ml, so I’d make more. Just in case. 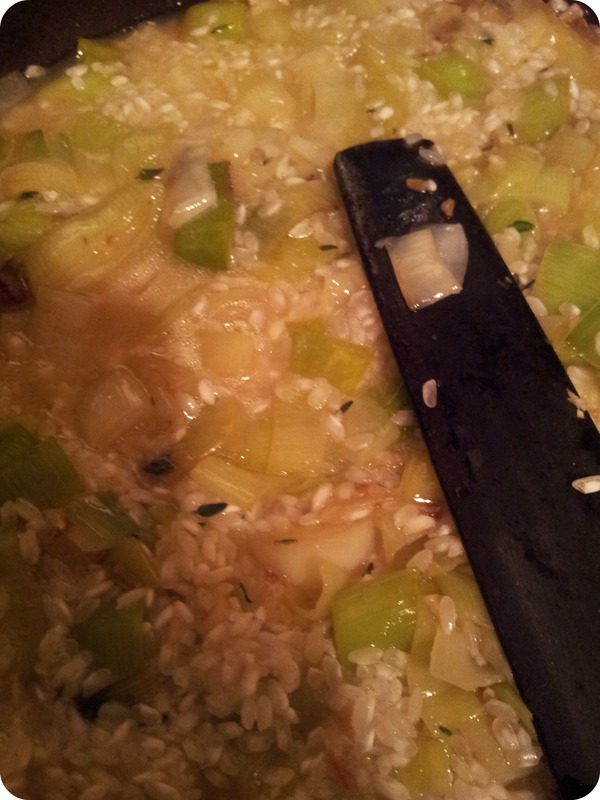 Stir the dry rice through the soft leeks, and pour over enough stock to just cover, like walking on a flooded field: the way the water puddles up through the grains as you pour it over, the way the surface seems to shine. Stir occasionally; let the rice absorb the stock. Add wine. Wait. Stir. Add stock. It will stick if you don’t watch it, but it almost certainly won’t matter too much. Wait. Stir. Taste. Add wine. You can carry on like this for quite some time. Tall Man notes that making risotto is a very meditative thing, and it is. Maybe if you keep stirring, there will be fireworks, just for you. Anyway, when the rice is tender, give it one good stir, and leave it for a minute, to slice the Taleggio. Biggish chunks are fine. Leave the rind on. Add them to the risotto, and stir through, and let it melt into gorgeous comfort. Spoon into bowls; add a grind of black pepper, and a brief twist of lemon juice. Sofa. Blanket. Slump. Eat. Oh, and get the mulled wine on. And don’t worry. Yum yum – I adore taleggio. Just found your blog the other day and it is wonderful. Thank you for sharing your stories and your recipes. Cooking through my bad days doesn’t seem so daunting anymore. One quick question: how much rice should go in this? American cup measurements (I know, I know, I’m sorry….) if you have them. If not, I don’t mind a bit of mild calculus. How much rice should I use?